1.The best melt time for glue stick in 100w Glue Gun is 5-8 Minutes. 2.The strongest viscosity comes after 2 Minutes when the tabs put on the car. 3.the yellow glue has the strongest viscosity.Suit for Harder Parts. 4.Please be patient while operating. 5.If you have any questions,please feel free to contact us directly,we'll try our best to help you. Effective and Safe---Efficient and safe to pop out dents,repair door ding and hail damages on the metal surface,such as auto,motorcycle,refrigerator,washing machine etc.No damage at the original paint. 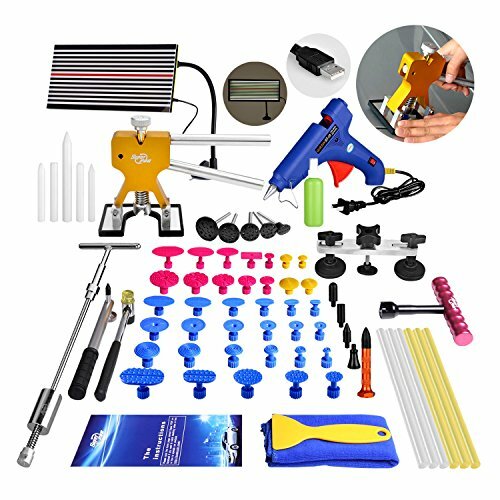 Easy to operation---Suitable for any person to deal with any dents,hail damages.a good helper for you and a good gift for your friends or families. Good quality----Main materials:Stainless steel,rubber & durable plastic.The dent pullers which are designed with ergonomic can save labor and easy to lift,very sturdy and have a long lifetime.all items which will touch the auto are made of the rubber or plastic.they will don't hurt the auto surface. We are professional manufacturer and honest sellers,focus on quality is second to none.And we protect the right of the customers.We also accept return if you are not satisfied with your purchase,which seldom happen. Let's get them bought for your lovely cars. If you have any questions about this product by Super PDR, contact us by completing and submitting the form below. If you are looking for a specif part number, please include it with your message.